Simon Cowell has broken his two-year long social media silence to share a snap of his son Eric. 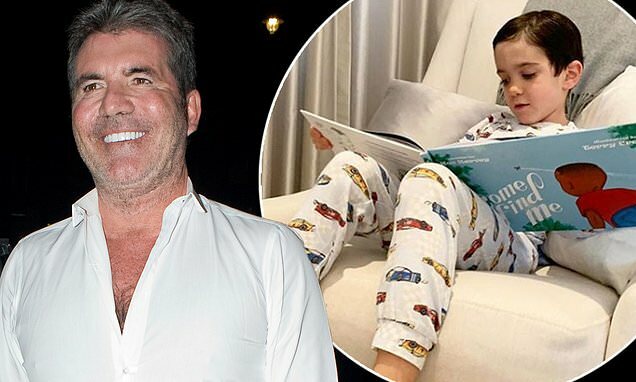 The X Factor judge, 59, who hasn't posted on Instagram since June 2017, delighted his 1.3million Instagram followers by sharing the photo of his son reading a book. Simon wrote alongside the photo: 'Eric reading his new favourite book 'Come Find Me' and it's illustrated by my friend @terrycrews'. Many of the music mogul's fans remarked on how big Eric, five, has gotten and could see the resemblance to his famous father. Simon and his other half Lauren Silverman welcomed Eric in February, 2014. The TV judge's sweet social media display comes after he revealed there will be two versions of The X Factor this year — one boasting a celebrity line-up while the other will see former contestants battle it out in an all-star edition. Similar to the current US series, entertainment manager Simon is launching Britain’s Got Talent: The Champions, set to run alongside the regular show. In an interview with The Sun, the Syco executive insisted the 'time feels right' for the massive shake-up, but is still in the process of ironing out the details.